We heard his breath first – eergh eergh aaargh. It was more like grunts than breathing, the sound of someone hating himself for pushing through an obstacle he would rather not deal with. When the man finally stepped in our sight, Jure and I leapt away from the shade-covered rock we’ve been sitting on to give him the space instead. He might look like he’s in his early twenties, and thus younger than us, but his yellow shirt was soaked with sweat and his face was in a shade of pink much darker than should be endured by any human beings. Jure and I looked at each other, our eyebrows raised. 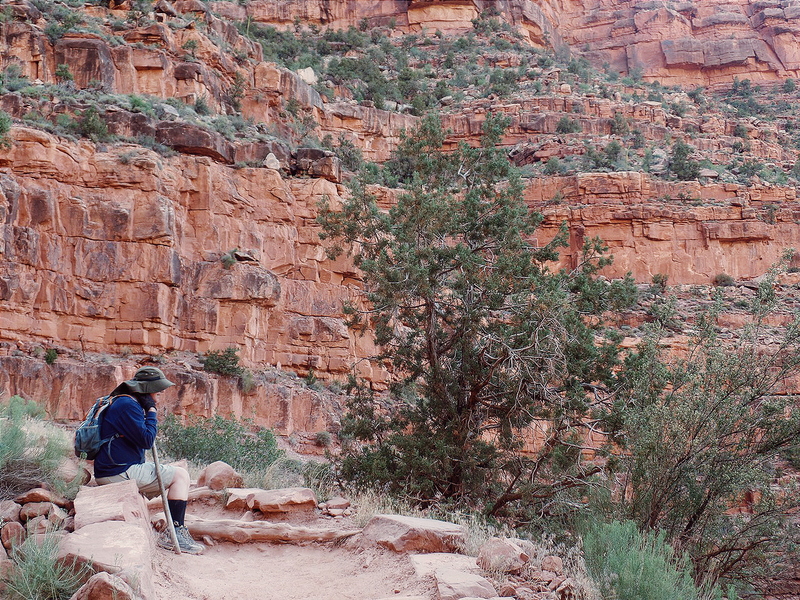 It was almost 5pm and we were somewhere on the last mile of the Bright Angel Trail at the South Rim of Grand Canyon. The North Rim is 220 miles away and if we were to believe him, this guy would have already been hiking for more than 16 hours. He was either lying or insane, but it didn’t matter which was the case, for he was in pain. I probably looked like him myself the day before, when we hiked up the South Kaibob trail at 5pm after spending hiking throughout the South Rim before. My lungs were on fire that afternoon. We walked away from the grunts after offering some words of encouragement. I empathized with his pain, although our walk was far less ambitious than his. 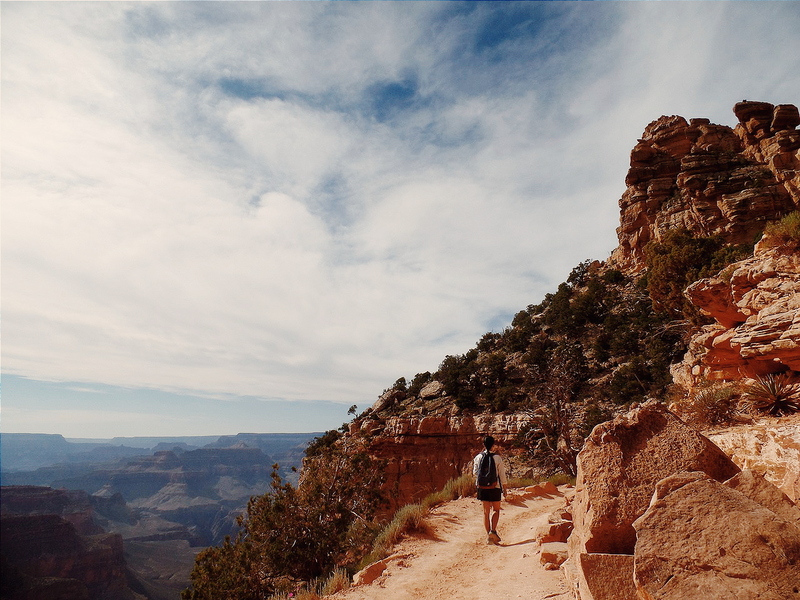 Hiking in the Grand Canyon is not to be taken lightly. As signs all over the national park say, the Canyon demands respect. The heat is unforgiving, and on this particular day, a ranger we met on the way down said that it was “hot enough to fry an egg on a garbage can”. It is deceptively easy in the beginning, for all the trails go down to the Colorado River, but it takes two to three times as long to hike back up, especially since the shades are far and few in between. 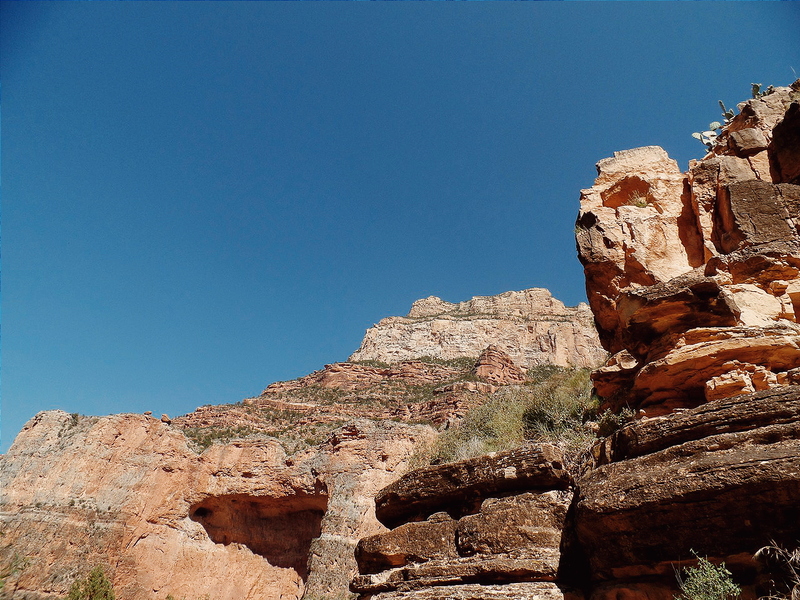 Truth be told, hiking in the Grand Canyon is challenging, but it’s not as hard as the warnings made it to be, especially for seasoned Indonesian hikers. The trails are wide and solid, as opposed to the undependable, criss-crossed, made-as-you-hike trails in many Indonesian mountains. The hike we did was considered moderate by the park, but it was fairly easy even for us greenhorn hikers. We could have walked further down to the Indian Garden with Twosocks and our three other friends, but it would be a struggle for my lungs and I wanted to make sure that I finish the hike before 7pm because the rangers told us it is when rattlesnakes start to slither out. Our hike back up to the Canyon rim was a pleasure. We walked as slow and as far as we liked. We were liberal with our breaks; in fact, we stopped every time we found a shady spot and sat as long as we liked. This kind of hiking is my jam. I’ve never had the urge to ‘conquer nature’ or to push myself physically. I don’t understand why I’d have to push push push my way to the top of a mountain to only take a short pause to enjoy the view from the top, before having to push push push my way down the mountain. I would much rather walk slowly, out of necessity because of my weakened lungs and to take my time to enjoy my surroundings. From the rim, Grand Canyon looked surreal, as if we were looking at it through a slightly opaque screen. Maybe that was why my knees didn’t turn into jelly even when we were standing so close to the edge. 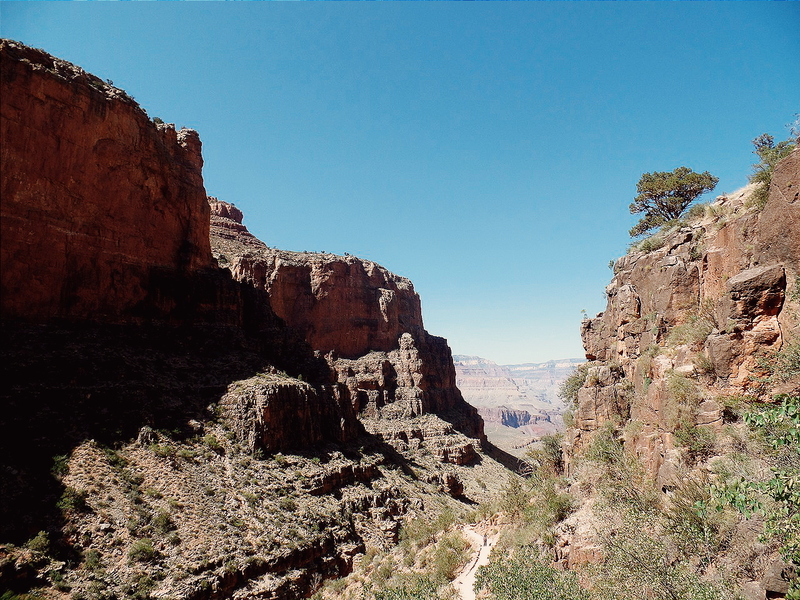 I could only feel the enormity of the Canyon when we were in it, during the hike up when I was less focused on getting to a destination or catching up with my friends. I was a tiny speck amidst the red rocks and the Douglas Firs and bushes. 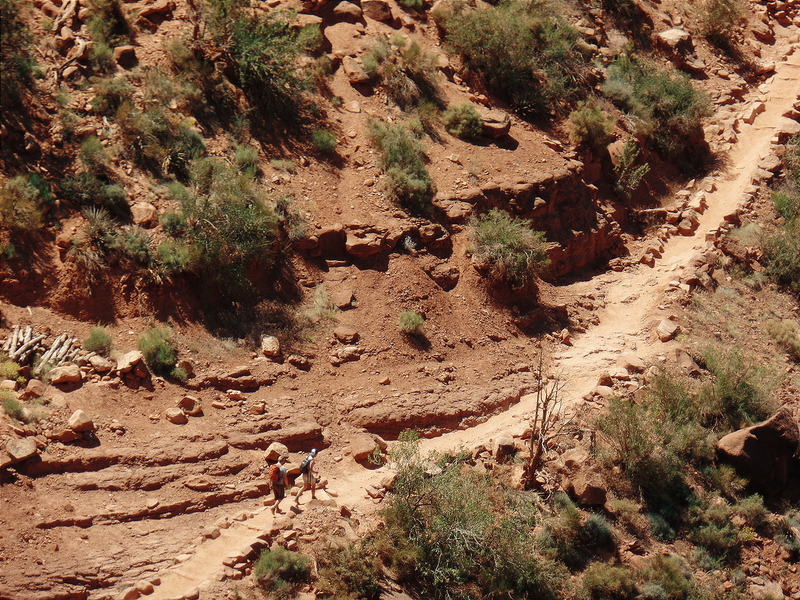 The Canyon looked empty and deserted from above, but squirrels and mountain goats passed by during our breaks. Up close, I could see that smaller rock hills in the Canyon come in similar sizes. It was incredibly uncanny. You could almost conceive the smaller rock hills as UFOs, and that the whole Canyon was where the Mothership landed. Jure laughed when I said this to her, but she nodded in agreement. Later that day, we found out that there tours arranged with people who claim they’ve seen aliens in Grand Canyon. Our climb took twice as long as the hike down, but we still rewarded ourselves with ice cream at the top – espresso for me and cookies and cream for her. We saw the guy who hiked from the North Rim when outside the ice cream shop, laying motionless on a bench, his face covered with a wet towel. He deserved the break. We walked to the edge of the rim, looking down to see whether we can spot our friends who should have been making their way up by then. A buzz started on our right, a soft hum that got more urgent as more people flocked by. It took a while until Jure heard what they were talking about. Condors. A condor bird in the flesh! There it was, a few steps to our right, a condor bird casually perching on a ledge. Its head was as pink as the guy who was lying motionless a few meters away, his beak was as menacing as I always thought it was. We could see the number 16 tagged on its wings; the Grand Canyon National Park keeps tag of the condor birds as part of their recovery and reintroduction program. Jure and I started talking about whether the condors referred to in the TV series of our childhood, Return of the Condor Heroes, are the same as these Arizonian ones. Two other condor birds flew by, circling above our heads. “I wish our friends below could see this,” I murmured. It’s ibdeed challenging, but the view is worth the prize. Breathtaking. Oh I pity the man–he pushed himself too hard, but maybe he didn’t want too miss anything so he forced himself hiking for such a distance. Hey, so we could see UFO there? Interesting, maybe I should join one of those trips :haha. what a beautiful view and joyful trekking I guess it was!